Firstly let us clear up one thing: many people confuse the words fossilised and petrified. A fossil is any remains of an animal or plant or trace of it, such as a footprint or even only a chemical residue, so any clue that some form of life has been there is technically a fossil. Original: where the actual creature is still there, such as a frozen Mammoth, or the green leaves found 600m (2000’) deep in the Alaskan oil fields or the original wood found up to 900m (3000’) below the surface in Texas. Altered: where the chemicals in say a plant have been reduced to a Carbonised film of the plant which still show its shape. Sometimes the chemical remains are so abundant we refer to it as a fossil fuel such as coal where there are so many carbonised remains one on top of the other you can hardly see individual plant at all. Mineralised: where the spaces in the wood or bones are filled with a new mineral. The original bone is still there. Many dinosaur bones are of this type. Imprint: where all remains of the creature have gone but the 2D ‘print’ of creature shows its outline. Mould: where the creature has gone but its full 3D shape has been preserved by what it has been buried in. Even the Roman people covered in ash from Mt Vesuvius qualify this way. Cast: where a shell has been filled with sediment then the shell has dissolved away leaving an exact copy. Trace: where no remains of a creature exist except a trail or footprint to show it was there. Replaced: where the whole creature has been chemically replaced or altered so that what remains is an exact copy of the original sometimes down to even microscopic detail. When the original is wood, and the chemical involved is silica, it is the most common form of petrified wood. 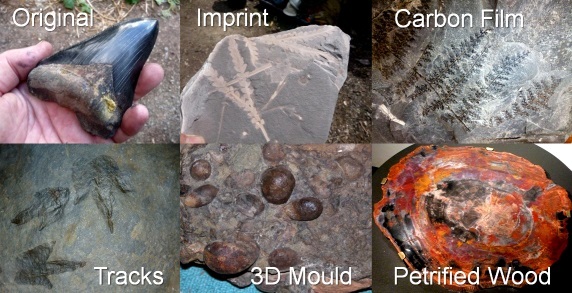 Below are some examples of different fossilisation processes from the Creation Research collection. Returning to the Homo naledi bones. Ref. Dirks et al. eLife 2015;4:e09561. DOI: 10.7554/eLife.09561, pp22-24. When bones have been filled by iron or other chemicals they become quite heavy and discoloured. The fossil bone pits we have established at our Jurassic Ark Museum are showing that this can happen very quickly, i.e. months, not millions of years. The H. naledi authors also suggest the bones show signs of being gnawed by snails and beetles. (Dirks et al. eLife 2015;4:e09561. DOI: 10.7554/eLife.09561, p18) This usually indicates that the bones have not been buried deep under any protective layer that would have prevented beetles and snails from scavenging them, and tends to support the claim that the bones belong to many creatures that died outside the cave, were not buried, and got into the cave through being washed in. None of this evidence helps any evolutionist claim that this new ‘skeleton’ made of unconnected bones, is of any help to their theory at all. 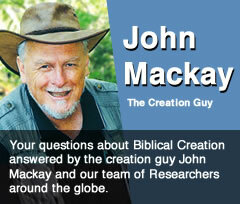 To learn what fossils really show about the history of the world, see the Creation Research DVD Darwin on the Rocks. Preview here. Buy from webshop here. Homo naledi image (at top): Copyright Berger et al. eLife 2015;4:e09560. DOI: 10.7554/eLife.09560 Reproduced under the terms of the Creative Commons Attribution License, which permits unrestricted use and redistribution provided that the original author and source are credited.